Artificial intelligence will drastically affect manufacturing productivity, as AI is combined with collaborative robots, supply chains, and enterprise systems. In 2015, Minneapolis YouTuber Andy George set out to construct a chicken, cheese, tomato, pickle, and lettuce sandwich — from scratch. Over the next six months, George made his own salt, grew vegetables, harvested wheat, milked a cow, and murdered a chicken. In the process, he spent $1,500 and countless hours, not including the labor cost! This small snack ended up costing approximately 300 times the price of an equivalent sandwich in your nearest supermarket. Now besides the entertainment value of this video, what really comes to mind from viewing this is just how far our manufacturing processes have come in supplying cheap and plentiful goods. Using advanced supply chains, mechanized systems, economies of scale, Lean, Agile and Six Sigma-enabled process improvements, manufacturers can now deliver products at scale and at a fraction of the cost than what would have seemed feasible only a few decades ago. But manufacturing is on the brink of further disruption, a disruption that will forever alter the way we produce, distribute, and consume goods. This disruption is going to be led by one technology: artificial intelligence. You’ve no doubt already seen factories with armies of robots constructing, welding, painting, and packaging. However, these bots are often dumber than they look, unable to perform tasks outside of a limited capability and often not sufficiently safe to operate alongside humans. This is not AI! 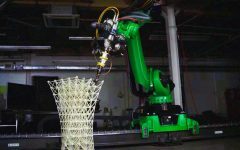 Cognizant’s Center for the Future of Work has studied AI’s impact on manufacturing. AI is different. Advances in computing power will give machines abilities once reserved for humans — the ability to understand and organize unstructured data such as photos and speech, to recognize patterns, and to learn from past experiences on how to improve future performance. And true AI is now finding its niche in manufacturing as the technology matures and as costs drop. Manufacturers are quickly realizing the massive impact this technology will have. In a recent study by Cognizant’s Center for the Future of Work, manufacturing execs stated that AI would have the biggest expected impact of new technologies by 2025, fueling a whopping 395% of growth. So how will AI affect manufacturers, and what will the implications be for those that don’t move to adopt this technology in their processes? In a market that is often defined by high capital investments and low profit margins, the movement of operations to low-wage countries previously seemed inevitable. But with rising wages in China and India, the improvements to efficiency and productivity brought on by AI could well bring manufacturing back onshore, at a lower cost point than the offshore equivalent. For example, a report by McKinsey indicates that it is now possible to automate 30% of activities in 60% of manufacturing occupations in the U.S. and Germany. And it’s not just a matter of replacing human jobs. AI assisted machines will be able to do previously human jobs better and at all times of the day. For example, AI-assisted visual inspection machines can detect faults with around 90% greater accuracy than a human and can do it in half a second. As previously mentioned, the robots and automated machinery we find in our factories today can be dangerous to work alongside. But with flexible algorithms, machines can learn new tasks, most importantly in this instance, perception. This would allow AI robots to be more capable and better at engaging with humans. Machine vision is key to building true perception in robots, but sensitive cameras are the easy bit. Adding actual understanding of image recognition is where it gets tricky. Firms such as Landing.ai, started by Andrew Ng, Google Brain’s former founding lead, are tackling this by creating machine learning algorithms that can be trained off as little as five sample images. 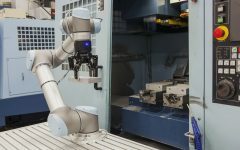 Technologies such as these are giving rise to collaborative robots, or cobots, that can work safely and productively with humans. It’s easy to get caught in the “robot mentality” when looking at AI within manufacturing, but AI will influence manufacturing in numerous areas outside of robotics. In the supply chain, for example, algorithms can perceive patterns of demand for products across time, geographic markets, and socioeconomic segments while accounting for macroeconomic cycles, political developments, and even weather patterns. The output can be a projection of market demand, which in turn could drive raw material sourcing, human staffing, financing decisions, inventory, maintenance of equipment, and energy consumption. Enhancing the supply chain is one aspect, but AI can be used to predict maintenance cycles of machinery and even preemptively determine demand for products lines from social media posts. As we can see, the impacts of AI are going to be felt throughout the manufacturing sector. Most importantly, however, will be the impact to the bottom line of manufacturers. Following on from these efficiency and productivity improvements, market dynamics will undoubtedly pass savings on to the consumer, meaning that the lower cost of consumption for many products will completely polarize manufacturing consumption between producers that have adopted AI technology and those that haven’t. For those that have, sales and margins will initially skyrocket but will ultimately level out as adoption of AI technology becomes more mainstream. But for those that miss the boat, the already tight margins and turnaround times in the industry could well spell the death knell for these organizations. Benjamin Pring is co-founder and managing director of the Center for the Future of Work at Cognizant Technology Solutions.